Seems all are related and are inter-related to each other. Is there any text that suggest the order in which we should try Samadhis? Do all samadhis are required or based on personality some are optional ? Is there any side effect of Samadhi? Is that possible to achieve Samadhi without guidance of in-person Guru just by knowledge by books & try to practice that? Please forgive my ignorance if something seems foolish to ask since I am seeking knowledge and yet to advance this stage experientially but I wish to seek that if that is possible. Please guide me. Your question is based on Yog Sutras of Patanjalii - Sutra No. 1.17. Below is the sanskrit sutra. Samprajnata , the Samadhi of Wisdom , occurs through the accompaniment of the appearance (RP ,BB) of gross thought ( Vitarka) ,Subtle thought ( Vichara) , ecstasy (ananda) and I-am- ness (asmita). Here Patanjali is describing various types of Samadhi's or meditation a Yogi should gradually practice in order to purify his mind for achieving Moksha or self-Realization or enlightenment. The soul purpose of all these all types of samadhis is to gradually develop Dispassion in his mind and to isolate him from his material as well as subtle world and to lead him towards his final goal. This is very difficult and laborious task. For answring purpose i am taking help of commentary provided in Yoga-Sutras of patanjali with the exposition of Vyasa - Translation and commentary by- Pandit Usarbudh Arya- Vol.1 . Do all samadhis are required or based on personality some are optional? From commentary we come to know that all these steps are sequential and gradual , although not dependent on each other but are necessary in achieving final goal. And why are all these levels or types are necessary in achieving final liberation the answer can be found in below passage ,where it is said that in Practicing samadhi or meditation a yogi experiences some faults in each level of realization and thus he develops dispassion towards each of these types or levels until the final realization occurs. It is also said that just mastering each of the stage or type is not important but before going to next level or type a full dispassion towards last type or level should be achieved .The purpose of each type is to lead a yogi sequentially to get free from all material as well as emotional bondages step by step. And in the process he overcomes the previous level and develops dispassion towards previous level and the outcome of that level .i.e. siddhis etc. So we can see that achieving Kaivalya or Moksha or enlightenment is a gradual or sequential process. And during all types of samadhi a Yogi is sequetially gets freed from various assumed bondages.And in the last samadhi stage i.e. in a cognitive ( asamprajnata) samadhi , final enlightenment happens. One can achieve final state of Samadhi Or Moksha through grace of God Directly. A Yogi can bypass all the stages of Samadhis and can directly reach to final stage by the grace of the God through path of Devotion i.e. Bhakti etc. avoiding all the labour. In such a case he do not experience the other types of samadhis and their outcome i.e. siddhis etc. He directly gets enlightenlemt from God. However it is suggested that these stages or types are there and one should go through them in order to achieve the grace of the god , they make a yogi's mind pure step by step and makes him fit for grace. The order in which the four stages are practised and mastered are important (BG NB).It is clearly stated however (BG) that , if a yogi makes spontaneous ascent to a higher ground by the grace of the God , he then need not climb methodically and laboriously over the lower steps (BG) .Grace , then is a shortcut which bypass the method. It must be remembered however ,that when one climbs to a higher plateau through force such Grace, the lower siddhis attendant upon the practice of earlier steps do not occur .It is only for some reasons one need those siddhis - even they are relevant to one's spiritual attainment ,station and progress. 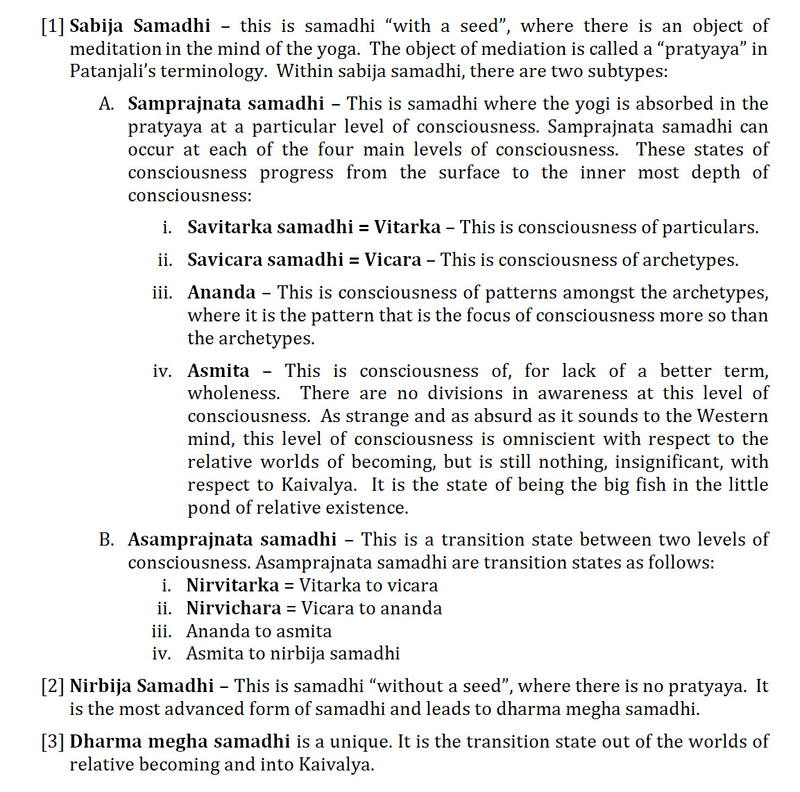 So in conclusion all these types of Samadhis are gradual and sequential. They are designed so that a yogi step by step can gets isolated from all his bondages of material as well as subtle world. leading him towards final stage. Although he can directly achieve enlightenment through grace of God , these types helps him to become fit for the Grace , so all these types are important even one wants the Moksha through Grace via Bhakti etc. So it is assumed that a Yogi should practice all these types in order to gradually purify himself and becoming entirely free from this material as well as emotional world . Even in case of attempt of direct enlightenment these types helps and makes him fit for Grace of God. Not the answer you're looking for? Browse other questions tagged yoga yoga-sutras samadhi raja-yoga .